Future Day 2015: Report from the India Future Society Conference What is the best Film AI of All Time? Last week Len Guarente announced his company will be selling a proprietary formula based on NR, the NADH precursor. This week, there’s an article about a project at Novartis to make a safe anti-aging pill from rapamycin. I’m more excited by the latter than the former. Several readers have asked my comments on the Guarente formula, being sold throughElysium Health. Len Guarente is a solid, innovative scientist who has contributed a lot to our field and trained several students who went on to make substantial contributions of their own. He’s also an honest guy, with his heart in the right place. The formula he plans to sell consists of Nicotinamide Riboside and pterostilbene. I wrote about NR a in November. I’m not convinced. It’s just too easy to extend life span in worms and flies–much more difficult in mice and people. I have see no data on NR and life span in mice. The most promising results I have seen show that NR slows progression of Alzheimer’s Disease in mice that are genetically engineered to be susceptible to AD [ref]. 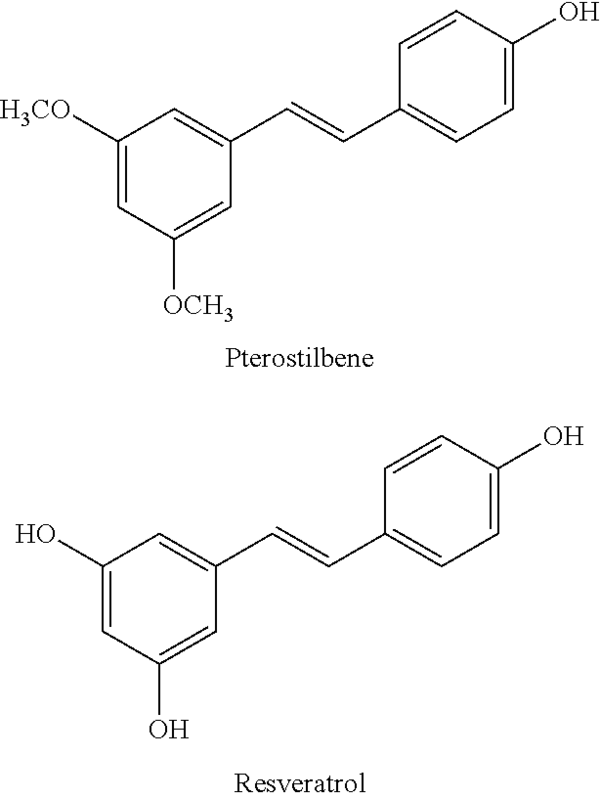 Pterostilbene has a chemical structure similar to resveratrol, and it is thought to be one of the beneficial components in blueberries. Pterostilbene shows the same kind of benefit as NR in the mouse model of Alzheimer’s [ref], but it does not extend life span of outbred mice [ref]. The press release about the Elysium product claims that there is an expected synergy between NADH and pterostilbene. Len knows a lot more than I do about genetics and biochemistry, and I’m inclined to give him the benefit of the doubt. But I don’t think that theory about the biochemistry of aging is in any shape that we should rely on it without direct evidence, and I look for that evidence in mammals. There’s an article from Bloomberg today about research at Novartis toward an anti-aging drug based on rapamycin. Rapamycin has the opposite issues from the Elysium product. It works great extending life span in rodents, but it is a powerful drug that may have too many side effects to be considered for general use by people who aren’t sick. It’s also prohibitively expensive for most of us, though it is not as difficult to get as it was a few years ago when the dramatic effect on mice was first announced in Nature. The reason rapamycin is scary is that its primary use is as a powerful immune suppressant, preventing rejection by people who are receiving organ transplants. If rapamycin makes the immune system tolerates someone else’s kidney (so the reasoning goes), what else will it tolerate? Cancer cells? Invading viruses? Herpes? The Bloomberg article hints that rapamycin may be more selective than that, and there is at least one study which seems to show that a drug acting on the Target of Rapamycin (TOR) can enhance the immune response as well as suppressing it. Novartis is not trying to market rapamycin, but to look for variants that might have the same benefit without the side effects. The article mentions Mikhail Blagosklonny as a prominent researcher who has enough faith in rapamycin to take it himself. He has written an article making the case that it acts directly on the core of the aging metabolism. It really does slow aging. “Rapamycin works on pathways that are too fundamental to normal cellular function to be used as a drug in healthy people until we have much more safety data,” says Valter Longo, a professor at the University of Southern California who discovered key pathways related to TOR. He points out that periodic fasting also shuts down the same pathways, without the side effects. We are at a stage in the science where there is much promise and little certainty. How do we decide when to take a chance and what to take a chance on? All the scientific data are still only half the input; the other half is in each of us as individuals. There is a reason there is so much scatter in the statistics, and even inconsistency from one study to the next. We are all unique individuals, both in how our metabolisms respond to drugs, and in what we want out of life. We may try to choose a strategy for the long haul, but if a treatment helps us feel more energetic or more alive or better balanced in the short run, that is and should be a part of the choice that we make. I have written about my experience with low-dose deprenyl, which I take for life extension, but which also loosens my inhibitions a bit in a way that I appreciate. A part of the calculus which is rarely discussed is our stage in life. The older we are (and the worse our health), the more inclined to take a risk on some treatment that may be our last best hope. I am 65 and can still hike all day, but I may have run my last marathon. I attend to the changes in my body from year to year, and I am willing to take some risks to slow down the loss. My friend, Stan, still works long hours at two psychiatry clinics at 86, and dances on the weekends. He is more willing than I to take a flier on a new idea. I hear rumors about 90-year-old tycoons who…but they are only rumors. I am saddened when a prominent member of the anti-aging community consents to request for treatment with Lupron by his 12-year-old son. Lupron blocks testosterone and delays puberty. The boy should know that he will have far better options for a long and healthy life as science continues to progress. I tell my daughters, in their 20s, to take good care of themselves and plan for a life of 200 years. In the near future, aging may no longer be the dominant risk to our health and wellbeing. I am more confident that tomorrow’s technology will be there to delay aging for our children than I am in our collective ability to deliver to them intact ecosystems that support human life. I have been taking Visomitin eye drops for a year and a half, and had an eye exam at the start of this period, and again this week. Results of the two eye exams were just about the same. Perhaps the beginnings of yellowing of the lens, an early stage of cataracts. I am fortunate to have eyes that focus well at mid-range (slightly myopic), so I still am comfortable without glasses most of the time. But over this year, I noticed that there are more times when I reach for reading glasses. If any readers have personal experiences to share with Visomitin, with Metformin or with Rapamycin, I hope you will comment below. This article originally appeared on Josh’s blog Aging Matters here. republished with permission.